For a political scientist, see Barbara Geddes. 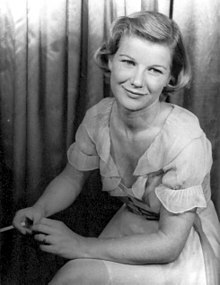 Barbara Bel Geddes (October 31, 1922 – August 8, 2005) was an American stage and screen actress, artist, and children's author whose career spanned six decades. She was best known for her starring role as Miss Ellie Ewing in the television series Dallas. Bel Geddes also starred as Maggie in the original Broadway production of Cat on a Hot Tin Roof in 1955. Her notable films included I Remember Mama (1948) and Vertigo (1958). Throughout her career, she was the recipient of several acting awards and nominations. Bel Geddes was born on October 31, 1922, in New York City, the daughter of Helen Belle (née Schneider) (1891 – 1938) and stage and industrial designer Norman Bel Geddes (1893 – 1958). She married theatrical manager Carl Sawyer (né Schreuer) in 1944; they had one daughter, Susan. They divorced in 1951. Later that year, she married stage director Windsor Lewis, with whom she had a daughter, Betsy. When Lewis became ill in 1967, Bel Geddes suspended her career to care for him; he died in 1972. Bel Geddes came to prominence in the 1946 Broadway production of Deep Are the Roots. The performance garnered her the Clarence Derwent Award, the Theatre World Award and the Donaldson Award (forerunner of the Tony Awards) presented to her by Laurette Taylor, for "Outstanding Achievement in The Theatre". From 1951 to 1953, Bel Geddes played 924 performances of the F. Hugh Herbert hit comedy The Moon Is Blue. In 1955, she created the role of Maggie "The Cat" in Elia Kazan's original Broadway production of Tennessee Williams' Cat on a Hot Tin Roof, and in 1961 created the title role in the Jean Kerr comedy Mary, Mary which became Broadway's longest-running show with over 1,500 performances. Both roles earned her Tony Award nominations. Other highlights include John Steinbeck's Burning Bright, Edward Albee's Everything in the Garden, and Silent Night, Lonely Night with Henry Fonda. Bel Geddes began her film career starring with Henry Fonda in The Long Night (1947), a remake of the 1939 French film Le Jour Se Lève. "I went out to California awfully young," she remarked. "I remember Lillian Hellman and Elia Kazan telling me, 'Don't go, learn your craft.' But I loved films." The following year, she was nominated for an Academy Award for Best Supporting Actress for her performance in the George Stevens film I Remember Mama. When an investigation from the House Un-American Activities Committee had Bel Geddes's name put on the Hollywood blacklist during the 1950s, it stalled her film career for a time, and she carried on with her acting on Broadway and an occasional part on television. Bel Geddes found new opportunity in television when she was cast in four episodes of Alfred Hitchcock Presents, including "Lamb to the Slaughter", in which she played a housewife who killed her husband by bludgeoning him to death with a frozen leg of lamb, cooking the murder weapon, and then serving it to the investigating police. She appeared in series such as Playhouse 90, CBS Playhouse, Riverboat, Dr. Kildare, and Death Valley Days. In 1977, she starred in the highly acclaimed production of the Thornton Wilder classic Our Town with Hal Holbrook. In 1978, Bel Geddes was the first artist signed to star in Dallas. The role of the family matriarch, Miss Ellie, brought her renewed international recognition. She appeared in many episodes, in almost every season of the series, for a total of 276 episodes from 1978 to 1990 (she was absent from the 1984–85 and 1990–91 seasons) and remains the only cast member to win the Emmy Award (Primetime Emmy Award for Outstanding Lead Actress - Drama Series) and the Golden Globe (List of Golden Globe Awards: Television, Best Actress, Drama). In 1985, she also received Germany's Golden Camera Award. In 1971, Bel Geddes underwent a radical mastectomy, which was an experience that she relived while playing Miss Ellie in the 1979–80 season of Dallas. The performance garnered her the Emmy Award. She was also honored by former First Lady Betty Ford for helping to raise breast cancer awareness. On March 15, 1983, Bel Geddes narrowly avoided a heart attack, but the media falsely reported that she had had a heart attack. Only days after she completed filming for the 1982–83 season, her doctor discovered a condition that required emergency quadruple bypass surgery. Bel Geddes underwent heart surgery, and she missed the first 11 episodes of the 1983–84 season and was replaced with actress Donna Reed for the 1984–85 season. With her health improved, CBS-TV persuaded Lorimar Productions to return Bel Geddes to the role of Miss Ellie for the 1985–86 season. She remained in the role until the later stages of the penultimate season of Dallas in 1990. Bel Geddes died of lung cancer on August 8, 2005, at her estate in Northeast Harbor, Maine, at the age of 82. She was cremated, and her ashes were scattered from a simple wooden boat into the harbor waters bordering her estate. At the revival of Dallas in 2012, Patrick Duffy (who played her youngest son, Bobby, in the original series) said: "Barbara is a big piece of our history, and it's important to me to honor her. To come back with Linda Gray as Sue Ellen and Larry Hagman in his J.R. hat, and then see the words Ellie Southworth Ewing Farlow on the gravestone made me think, 'Oh, that's right -- she's gone." "Through the whole first season, I don't think an episode goes by that Mama is not mentioned in reference to Southfork and the land," he said. Pulitzer Prize Playhouse Bethel Merriday 1 episode: "Bethel Merriday"
The Nash Airflyte Theater Molly Morgan 1 episode: "Molly Morgan"
1954 The Campbell Playhouse 1 episode: "XXXXX Isn't Everything"
1958 Playhouse 90 Sidney Cantrell 1 episode: "Rumors of Evening"
Decision Marcia 1 episode: "Fifty Beautiful Girls"
The United States Steel Hour Lily Barton 1 episode: "Mid-Summer"
1959 Riverboat Missy Belle 1 episode: "Payment in Full"
1960 Dow Hour of Great Mysteries 1 episode: "The Burning Court"
1965 Dr. Kildare Dr. Ruth Halliman 1 episode: "A Miracle for Margaret"
1968 CBS Playhouse Doris Gray 1 episode: "Secrets"
1969 Journey to the Unknown Inga Madison 1 episode: "The Madison Equation"
Daniel Boone Molly Malone 1 episode: "Sweet Molly Malone"
1976 Spencer's Pilots Maggie 1 episode: "The Search"
^ Pylant, James (2005). "The Midwestern Roots of Barbara Bel Geddes ("Miss Ellie")". GenealogyMagazine.com. Archived from the original on 2012-08-27. Retrieved 2014-01-27. ^ a b c "Barbara Bel Geddes — Biography". Yahoo! Movies. Archived from the original on 2013-01-16. Bel Geddes made her feature debut in "The Long Night" (1947) as an ingenue romanced by both Henry Fonda and Vincent Price. The following year, she earned an Oscar nomination as Best Supporting Actress as the narrator/eldest daughter in "I Remember Mama". ^ "Barbara Bel Geddes has open heart operation". The New York Times. Associated Press. March 15, 1983. Retrieved March 16, 2016. ^ Kahn, Toby (June 28, 1982). "To Wildlife and Dallas Lowlife, Barbara Bel Geddes Gives the Milk of Human Kindness". People. Retrieved December 17, 2017. ^ Actress Barbara Bel Geddes has died, MSNBC, August 10, 2005. ^ "The Late Miss Ellie Will Be Part of New 'Dallas' | TVWeek". www.tvweek.com. Retrieved 2018-04-19.